The Lincoln MKC crossover remains a favorite among vehicle owners who prefer luxurious crossovers. But, the vehicles are also created to capably perform. 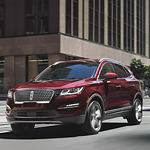 Learn how the Lincoln MKC meets your expectations by exploring our Traverse City inventory. Choose one of two engine options in the Lincoln MKC to get either 245 or 285 horsepower and the ability to tow up to 3,000 pounds. The sensors that govern the all-wheel-drive system make sure you have optimal control of the Lincoln MKC regardless of the terrain type or weather conditions. The stability system also ensures handling ability. Gyroscopic sensors monitor the vehicle's position approximately 100 times each second whether rain, shine or snow to make sure that each wheel has the right amount of traction. Learn more about the entertainment and safety technological features that come with the Lincoln MKC. Find an appealing vehicle and take it on the road for a test drive at Fox Grand Traverse Lincoln.